Local is good and can be very green. Shipping furniture from Asia, on the other side of the world, consumes enormous fuel. When a product is made just around the corner, it leaves a smaller footprint on the planet. Much of what we offer (i.e. our Floating Platform Storage Bed, Gemini Daybed Couch, Mondrian Storage Daybed Couch) we handcraft right here in our Central Square wood shop. We select solid cherry, oak and maple from nearby Massachusetts, Vermont and Pennsylvania forests. 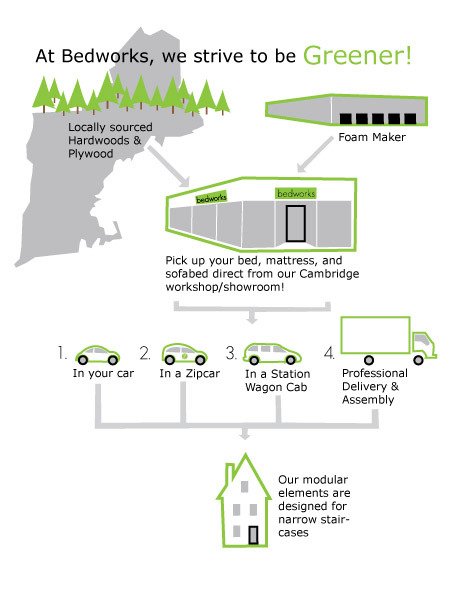 We order the longest-lasting poly foams made in Canada for our unique, custom mattresses. The designs we don't have space to make come from select manufacturers in Connecticut and Georgia, whose products we've tested for 20 years. Great products should offer confident, long warranties with corresponding long lifespans. We disagree with the wasteful mentality that fills up landfills and leaves customers dissatisfied. What we handcraft from solid hardwood carries our Lifetime Warranty, while the premium foam mattresses we hand-layer carry 20 year warranties, twice as long as innerspring mattresses. Some products we make here require gluing. We use safe, water-based glues that last. What we make is built to last, so you can enjoy its craftsmanship for many years.